International Journal of Biomedicine & Life Sciences is a double-blind peer-reviewed open access online journal published by Association for Anglo-American Studies, Macedonia. It is a premiere venue for discoveries in basic and clinical biomedical science that will advance the practice of medicine. It is an openly accessible journal published bimonthly and it is focusing on theories, methods, and applications in Medical Sciences and Healthcare. International Journal of Biomedicine & Life Sciences (IJBLS) is to provide a platform for scientists and academicians all over the world to promote, share, and discuss various new issues and developments in different areas of Biomedicine & Life Sciences. All manuscripts must be prepared in English and are subject to a double-blind peer-reviewed process. Generally, accepted papers will appear online within 8 weeks. 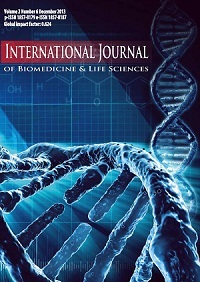 The scopes of the journal include, but are not limited to, the following fields: Advances in Alzheimer's Disease; Advances in Aging Research; Advances in Bioscience and Biotechnology; Advances in Entomology; Advances in Enzyme Research; Advances in Microbiology; Advances in Molecular Biology; Advances in Plant Sciences; Advances in Molecular Imaging; Advances in Nanoparticles; Advances in Parkinson's Disease; Advances in Agricultural Sciences; Advances in Cell Biology; Advances in Computational Molecular Bioscience; Advances in Food and Nutrition Sciences; Advances in Organic Chemistry; Advances in Behavioral and Brain Science; Advances in Biomedical Science and Engineering; Advances in Biosciences and Medicines; Advances in Biomaterials and Nanobiotechnology; Advances in Research; Advances in Microscopy Research; Advances in Natural Sciences; Advances in Applied Biosensor; Advances in Apoptosis; Advances in Applied Sciences; Advances in Animal Sciences; Advances in Biophysics; Advances in Depression; Advances in Genetics; Advances in Molecular and Integrative Physiology; Advances in Psychiatry; Advances in Regenerative Medicine; Advances in Stem Cell Discovery; Advances in Neuroscience, etc.